Every so often, we have a patient who presents with clinical challenges that need to be handled outside of the usual protocol. So it was with Lucinda, who presented with caries in 2 specific teeth that would normally have been treated by doing extractions. However, the health history showed Fosamax use and, upon further questioning, it was found that she had a history of heavy use of this prescription drug within the last 5 years. Consulting with Dr. Mark Ericson, our oral surgeon, the decision was madenot to remove teeth Nos. 3 and 18 because of potential healing problems in the bony socket sites due to the use of Fosamax. This article will present the case introduced above, demonstrating the alternative treatment that was done, and the current research for deciding upon the course of action outlined below. Figure 1. 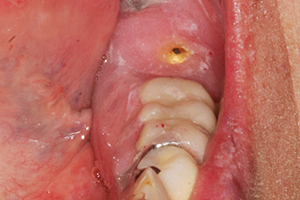 Severe decay in tooth No. 3 that would usually require extraction. Figure 2. 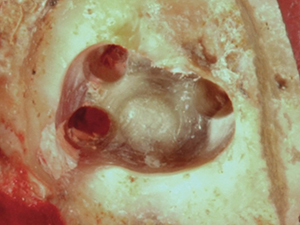 Severe decay in tooth No. 18 that would usually require extraction. Figure 3. Preserved root sealed with glass ionomers (GC Fuji II [GC America]). Figure 4. 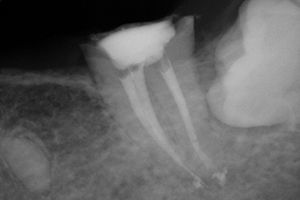 Acytel resin unilateral partial over preserved root (tooth No. 3). Note: photo was taken after 4 months of wearing the prosthesis. Figure 5. Tooth No. 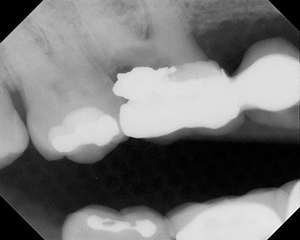 18 root preserved with root canal and glass ionomer. Figure 6. Retention preparation in No. 18 before composite resin was placed. One report8 confirmed 2 other patients who experienced osteonecrosis from BP causes were successfully treated with teriparatide, when used as adjunct therapy in ONJ; this is because it has an anabolic effect and presumed role in accelerating bone healing. ONJ is a serious but infrequent condition that has been recently associated with nitrogen-containing bisphosphonate therapy. Teriparatide may be a useful adjunctive therapy when ONJ develops. 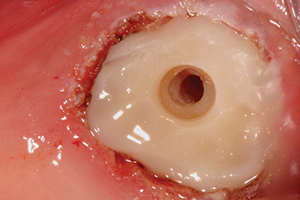 Hsiao et al9 found that the results of this preliminary short-term study suggest that patients taking long-term oral BPs can expect a satisfactory outcome with evidence of periradicular healing after conventional root canal treatment. Thus, root canal treatment may be considered a safe and realistic alternative to extraction in patients on bisphosphonate therapy. The issue facing all dental clinicians is to extract or not to extract a tooth when the patient has been or is taking BPs. 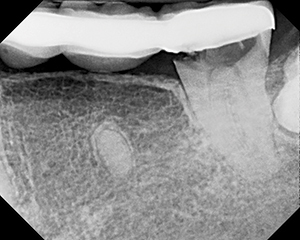 Even if the potential for osteonecrosis is small for any given patient, no dentist wants to be responsible for the patient getting this condition, and therefore, hesitancy on the decision to proceed with an extraction would be reasonable. Lucinda presented as a new patient with extensive decay in 2 teeth that would have ordinarily been treated with extractions (Figures 1 and 2). However, since her medical history included the use of Fosamax during a period of 5 years, it became apparent that extraction could lead to osteonecrosis in one or both sites, even though she reported having stopped taking the drug just prior to this dental visit. The question of an alternative approach seemed vital to getting an outcome that would provide a clinically good result while keeping her healthy. Figure 7. Glass ionomer in No. 18 prepared for ZAAG (ZEST Anchors) female attachment. Figure 8. ZAAG One-Step Drill (ZEST Anchors) for ZAAG female attachment preparation. Figure 9. 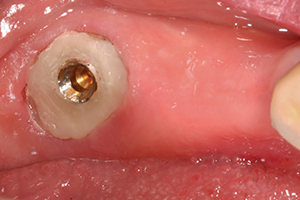 ZAAG attachment cemented into tooth No. 18. Figure 10. ZAAG male attachment placed into female ready for pickup. attachment. Figure 12. 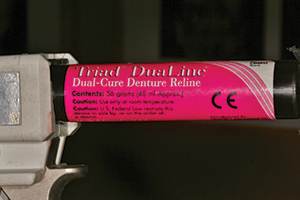 Triad DuaLine dual-cure (self- and light-cured) reline composite material (DENTSPLY Trubyte). Figure 13. Lower partial denture with the male ZAAG attachment snapped into female in tooth No. 18. 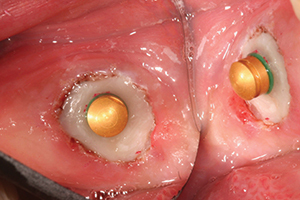 In order to restore the missing teeth, a unilateral partial denture of acytel resin was produced (Figure 4). At this point, this tactic has been successful for the patient. 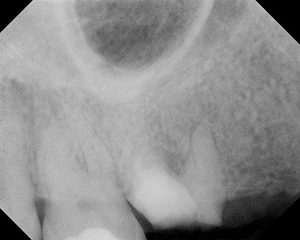 Endodontic therapy was done on the lower left second molar (tooth No. 18) by Dr. June Chang to keep it from extraction (Figure 5). Since the patient would now need a removable partial denture, a unilateral type was offered with tooth No. 18 receiving a ZAAG attachment (ZEST Anchors) for distal-end anchorage. Because No. 18 had a temporary restoration after the root canal, because the occlusal height above to No. 15 was limited due to super eruption, and because crown lengthening was ruled out due to the BP issue; the tooth was restored with composite down into the pulp chamber. The preparation can be seen in Figure 6. 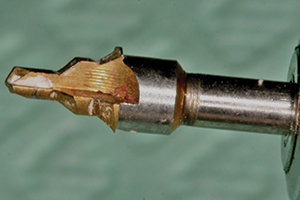 This restoration allowed for preparation for the ZAAG female attachment placement (Figure 7) using the ZAAG drill (Figure 8) and the actual attachment. The ZAAG female attachment was cemented into the preparation (Figure 9) using SEcure Cement (Parkell). The male attachment was tried in to evaluate the fit (Figure 10). 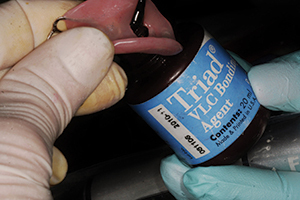 The unilateral partial denture was primed with Triad VLC Bonding Agent (DENTSPLY Trubyte) (Figure 11), so that the male ZAAG could be “picked up” with Triad DuaLine (DENTSPLY Trubyte) dual-cure reline material (Figure 12). The result was giving the patient a firmly fitting unilateral partial denture, using a tooth that normally would have been extracted. Figure 13 shows the unilateral partial denture with the ZAAG attachment bonded in using Triad DuaLine. During a dental career, we are sometimes presented with opportunities to be creative, offering the chance for a better outcome for a patient than his or her condition might normally warrant. 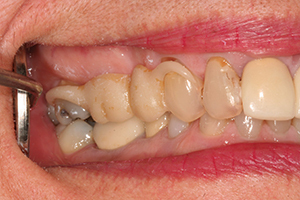 Having written extensively about and practiced minimally invasive dentistry, this case where the patient presented with a history of BP use for treating osteoporosis required that kind of approach. This compromised situation and the research supporting caution led to the alternate treatment shown. Each subject tooth continues to function well under the partial dentures.